Selecting overlay will present the signature window over the current layout at the bottom of the screen. This will let the user see the context they are signing from. Selecting the embedded option for the presentation will show the signature capture window in the same window as the container field. 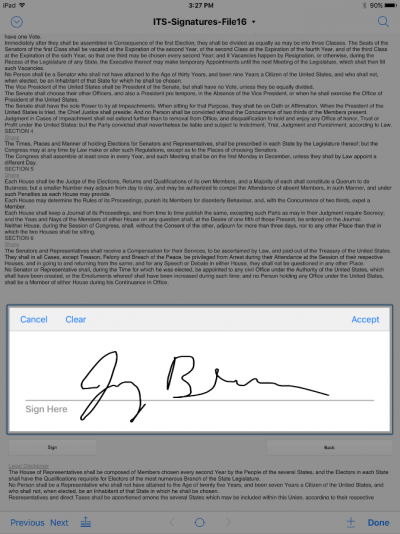 This option is great for signing a document on the screen. Be careful when selecting the embedded option though, make sure that the container field is large enough to contain all the parts of the signature capture. If the container is not large enough, FileMaker Go will default back to overlay. In my experience, the container field needs to be at least 350 x 200 pixels to be presented in embed mode. Full Screen gives the presentation you had in versions before FileMaker. 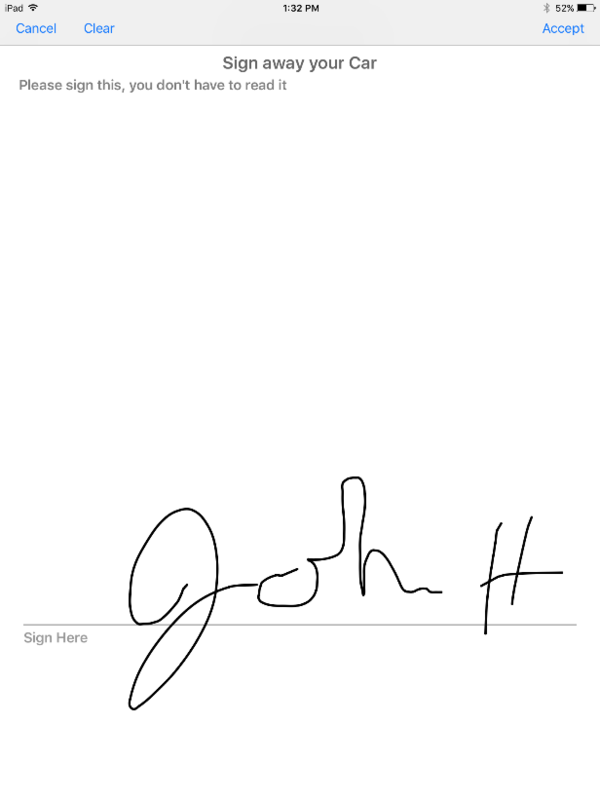 Now you can actually see what you are signing! Using this option, it gives the appearance of actually signing the document. 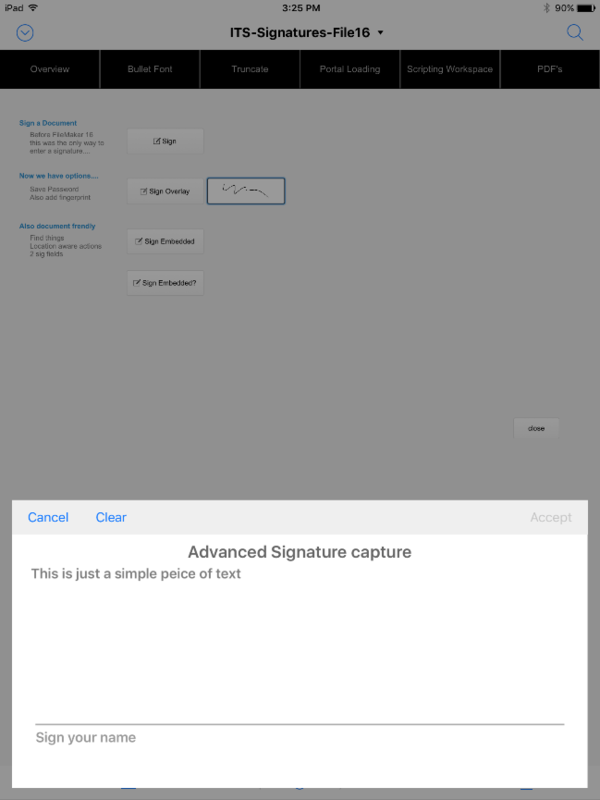 Depending on your specific situation you can now present the user with a neat and professional looking signature capture option to suit your needs. In addition to all of the new features that FileMaker 16 is bringing to us, there are a slew of older features that have been enhanced. One of them is the ‘Signature Capture’ feature on iOS. This feature has been around since FileMaker Go 11 and continues to evolve. In FileMaker Go 13 the user experience was enhanced to allow one-click access to the signature screen, and in version 14 we had the ability to modify the prompts on the screen. Now in FileMaker Go 16 we have the added ability to change the layout of the signature panel itself. In previous FileMaker Go implementations, inserting a signature would take up the entire screen of the device. While this is good for many use cases, signing out your kids from day care for example, there are plenty of scenarios where you might want an alternative presentation. Let’s say you are signing a legal document or contract, for example. Seeing the document that you are signing is probably a feature you’d want to have. In FileMaker 16, there are now three options when selecting a signature panel: full screen, overlay and embedded. 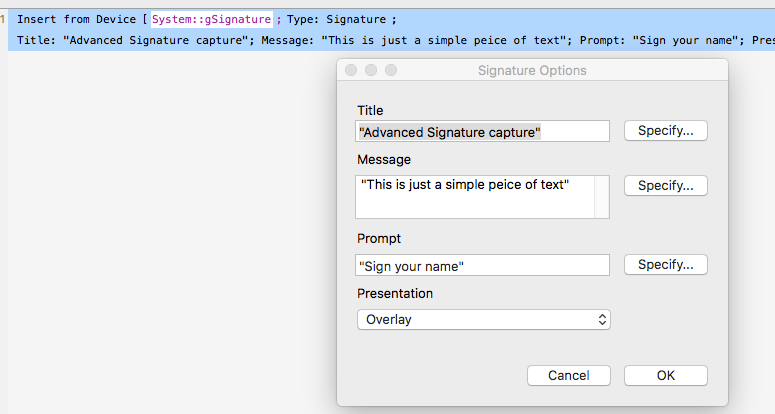 When setting up an ‘Insert from Device’ script step, you’ll see a new selection for presentation when you select type = Signature.